Image by Pierrick Contin. The Phantom Project is getting into ACup territory, having Oracle buying a pair of boats is a confirmation that the boat is providing some a stable performance, after a good 2-3 years of testing. It seems I'm going to confirm this live in a few weeks thanks to an invitation from Alex Udin. Philippe's face says it all on what he thinks about the boat. Not a flat day so interesting video checking how the FP behaves in waves. 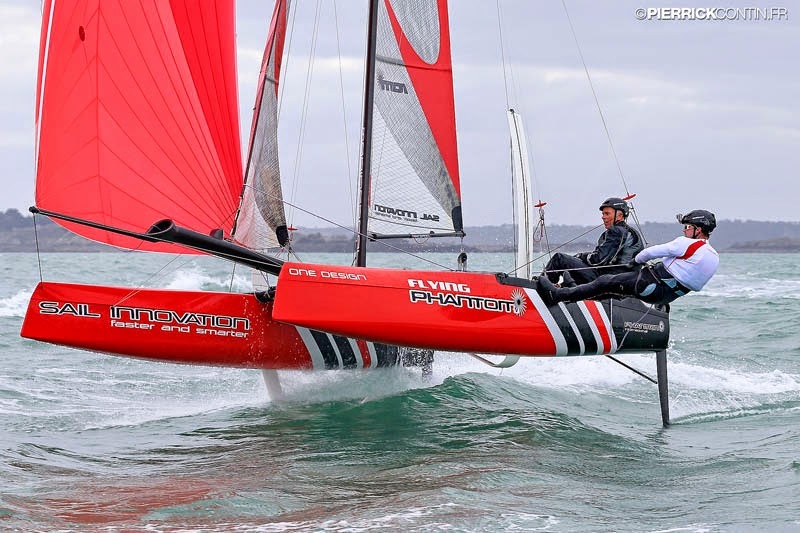 Philippe Presti, the French Olympian and coach of the America’s Cup champion ORACLE TEAM USA, has visited Phantom International in Saint Lunaire - France for some foiling sailing sessions on the Flying Phantom with the Phantom sailing team. “The purpose of my visit in Brittany was to try the Flying Phantom. You saw with the last America’s Cup we started to foil upwind and downwind and now we want to explore foiling with small boats. We are thinking it will be very good for the design of our future Cup boat. it was really enjoyable, of course in addition the business side of it, it’s a lot a lot of fun. In my career, I’ve started with very slow boats with the Finn dinghy and I really enjoy the changes. Sailing is a world where when you change boat you change world and I really enjoy to discover new stuff and foiling is really exciting. This was one of the most exciting days sailing a boat I have had for a while. The idea of buying boats for Oracle Team USA would be to train our sailors to fly; at the moment we have the big boat and we can fly on the AC72, but it is extremely hard to handle it term of logistics. Philippe Presti will go back to his coaching role with ORACLE TEAM USA and will soon have two Flying Phantom boats for skipper Jimmy Spithill, tactician/sailing team manager Tom Slingsby and the rest of the team to practice with at the team’s training session in Sydney, Australia.